Hoé-chheⁿ (Mars) sī lán Thài-iông-hē tē 4 oá Ji̍t-thaû ê he̍k-chheⁿ. I khoàⁿ--khí-lâi âng-âng, choâⁿ-á mā hông kiò-chò Âng He̍k-chheⁿ (The Red Planet). Hoé-chheⁿ ū 2 lia̍p oē-chheⁿ, Phobos kap Deimos, lóng sè-sè lia̍p, hêng koh ku-koài, pún-té eng-tong sī sió-he̍k-chheⁿ. Dr. Tony Phillips: "Making a Splash on Mars", Science@NASA article, June 29, 2000. 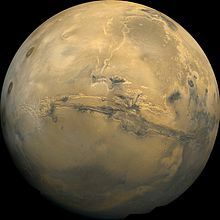 Phillips describes the Martian "gullies" and explains the conditions under which liquid water can exist on the surface of Mars. exploreMarsnow Interactive Mars base simulation. Winner of 2003 Webby Award for Science. Vladimir A. Krasnopolsky, Jean-Pierre Maillard, Tobias C. Owen, "Detection of Methane in the Martian Atmosphere: Evidence for Life"
Chit ia̍h siāng bóe tī 2018-nî 12-goe̍h 14-ji̍t (Pài-gō͘), 14:59 ū pian-chi̍p--koè.